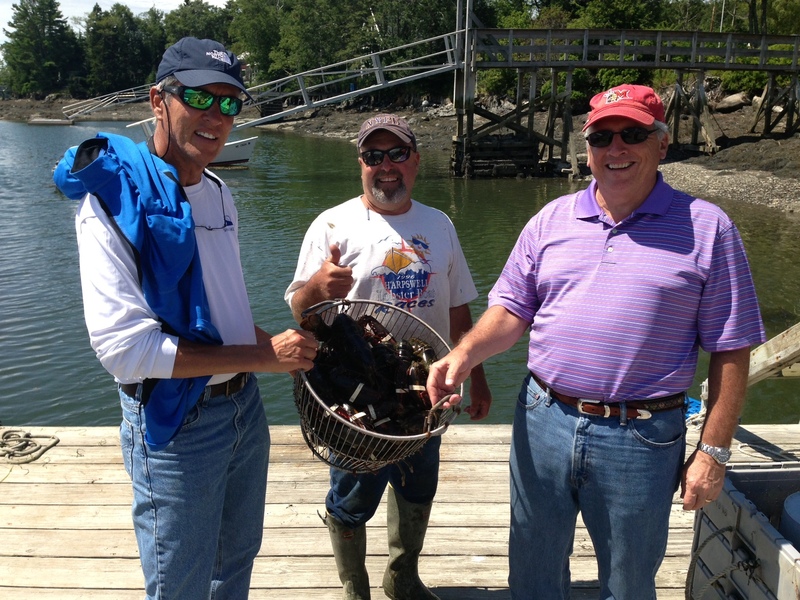 Last Saturday I went lobstering with the above cast of characters. The Maine sun rises at 4 AM in July. Lauri and I awoke as the crows were chattering over Peter’s Cove in Harpswell. Our host, Pete Cowgill, had a surprise for his guests. Pete is on the left in the photograph above. Fellow Sigma Nu, Terry Wright, is on the right. In the middle is our host, Ken Beebe. By trade,Ken is a painter. But as you will find out in a number of posts concerning our day on the water, he has many other remakable skills. One of those skills is captaining a lobster boat and managing well over 100 lobster traps in Basin Cove. Ken welcomed us aboard and we had navigated no more than 50 yards before he idled up to a white and orange marker designating the location of one of his traps. We watched as he hooked up an power winch to the rope running from the trap. He engaged the winch and up came a 3 foot trap with at least six lobsters thrashing about. After setting the trap on the gunwale of the boat, Ken began to measure the size of each lobster. He never once guessed at the size. He used a metal guage with a flange at 3 1/4 and 5 inches. A lobster had to be at least 3 1/4 inches from its eye socket to the meat of its first tail joint and no more than 5 inches. Inside those limits, the lobster was legal. In addition, he checked the lobster for a notch in its tail. An egg bearing lobster is notched in the tail by the captain and goes back into the ocean even though of legal size. Every notched tail lobster caught is returned to the sea because of its known reproductive capabilities. After emptying the trap, Ken baited a mesh net with three or four pogies (bait fish) which were approximately 4 to 6 inches long. The week old pogies were very fragrant. He also used a metal rod to string an additional three pogies on a line which was strung on the inside of the lobster trap. Each trap has several chambers. It is designed with an escape port for lobsters of very small size. In addition, there is a black rubberlike rectangle on the top of the trap which will ultimately rot and open in the event the trap is lost permitting any trapped lobsters to escape alive. Ken banded the claws of each legal lobster and placed them in a basket covered with a small tarp to keep the lobsters out of the sun. 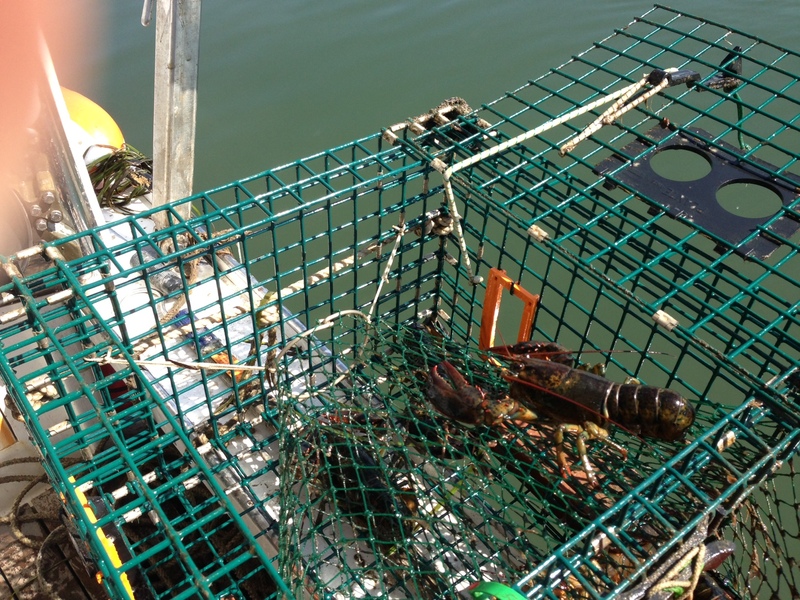 During the morning, we pulled approximately 16 traps which yielded 21 legal lobsters. We accomplished this while never leaving sight of Ken’s home. Quite a backyard! This entry was posted in Fishing Stories and tagged Basin Cove, Ken Beebee, Lobster, Maine, Pete Cowgill, Terry Wright, Trap by Tarpon Slam. Bookmark the permalink. Very nice depiction of lobstering with Ken! His last name is Beebe! Maybe that is why we can’t open the video? Was nice to meet you gentlemen! Glad you had such a great time.